The patient presents a history of classic Schamberg's disease of the lower extremity but has a rather extensive involvement of the body by a scaly persistent and somewhat purpuric dermatosis clinically suspicious for mycosis fungoides of a few years duration. The process is an atypical epitheliotropic purpuric T cell lymphocytic infiltrate. 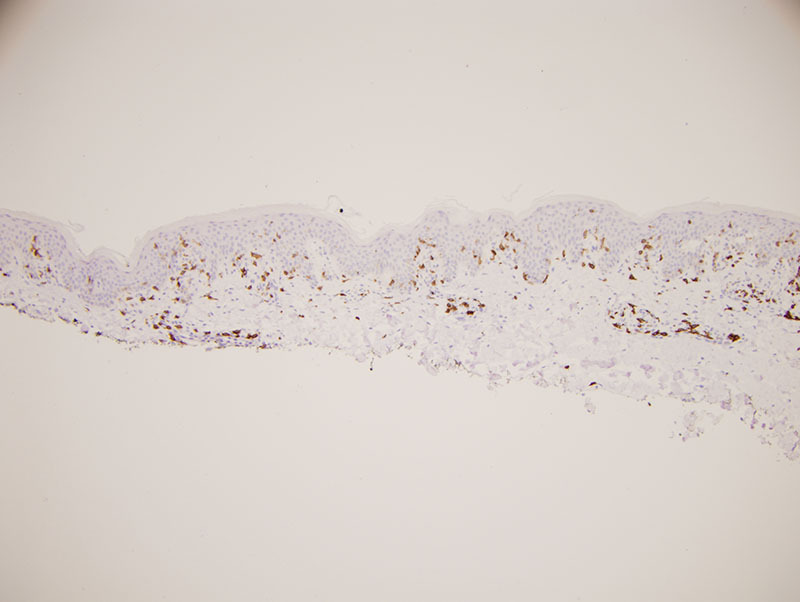 The overall pattern of migration of lymphocytes into the epidermis being quite passive along with the extent of cerebriform atypia and loss of CD7 would define this purpuric process under the general umbrella of an epitheliotropic purpuric T cell dyscrasia. There are really three primary categories: 1. Purpuric mycosis fungoides. 2. 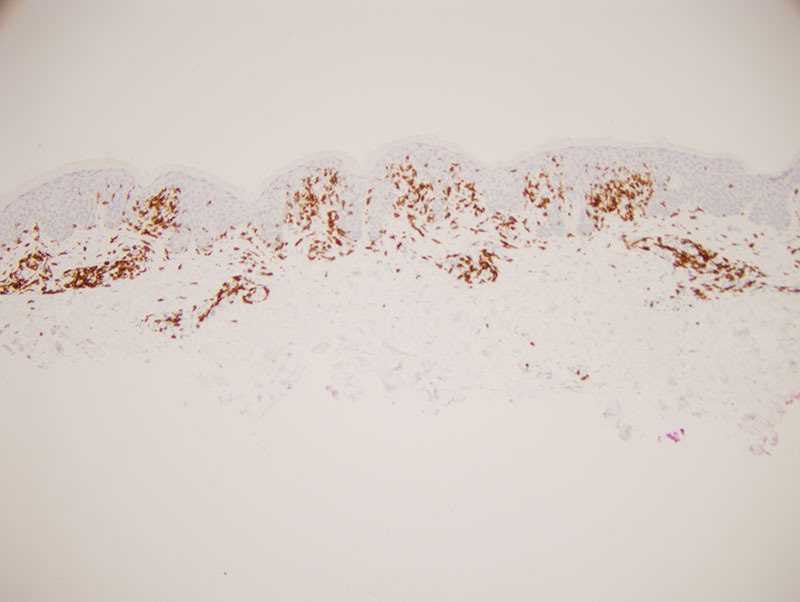 Idiopathic pigmented purpuric dermatosis as a well recognized form of prelymphomatous T cell dyscrasia that can presage purpuric mycosis fungoides and other variants of mycosis fungoides. 3. A drug associated reversible T cell dyscrasia mimicking purpuric mycosis fungoides most commonly triggered by antidepressant and statin drugs. The latter is unlikely given the long duration of the eruption and the negative drug history. 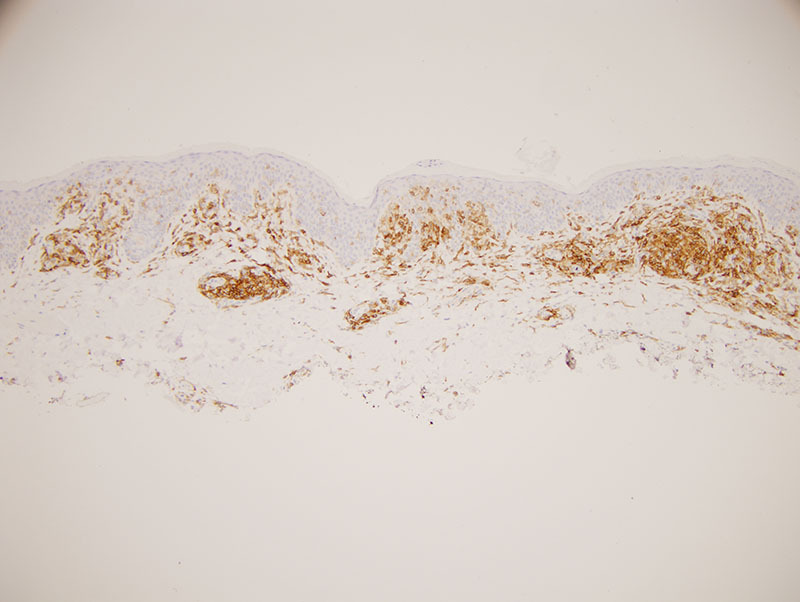 In idiopathic pigmented purpuric dermatosis there can be significant lymphoid atypia including cerebriform atypia with a significant loss of CD7 findings that have been documented in papers that I have written as well as other authors. Very critical in the distinction between idiopathic pigmented purpuric dermatosis and purpuric mycosis fungoides is the clinical examination. 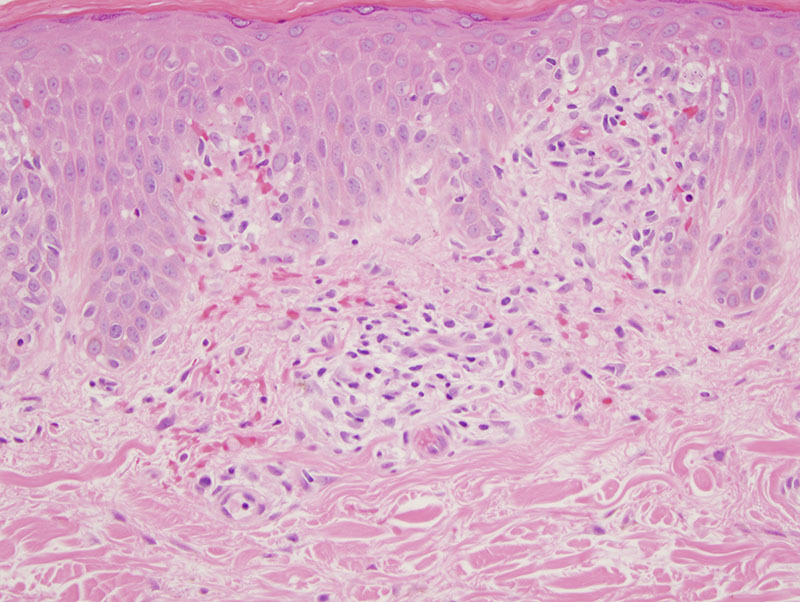 Given the clinical description this atypical epitheliotropic lymphocytic infiltrate is best categorized as purpuric mycosis fungoides arising in a background of pigmented purpuric dermatosis. 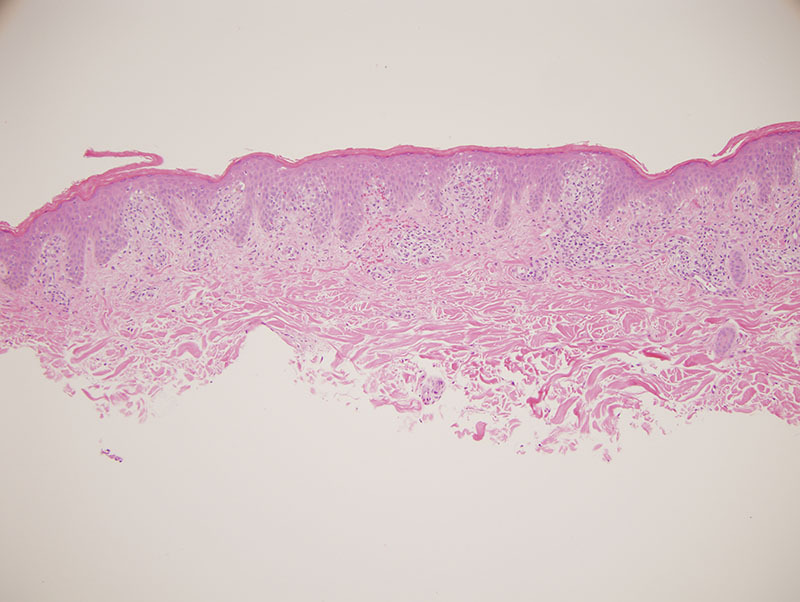 There is significant literature precedent regarding the development of purpuric mycosis fungoides in a background of pigmented purpuric dermatosis. 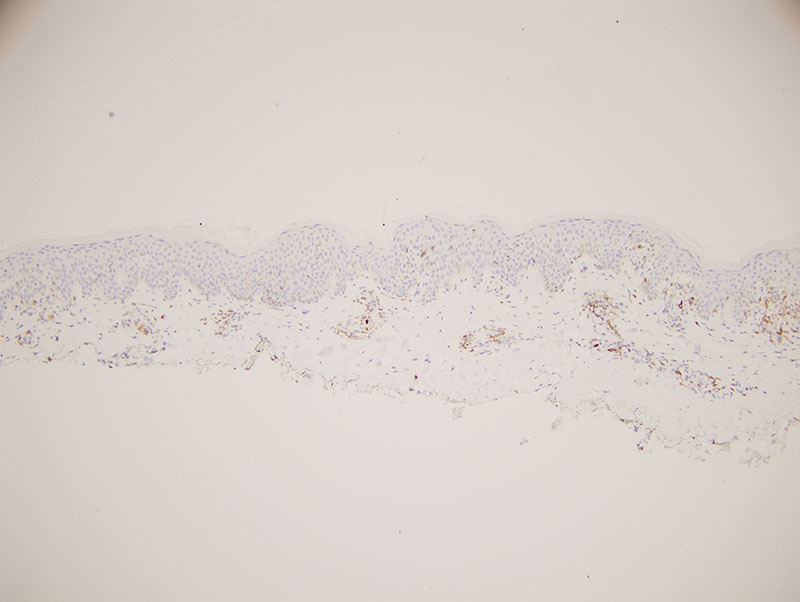 Demographically, this form of lymphoma developing in a background of pigmented purpuric dermatosis preferentially affects males in their forties and fifties recognizing that the onset of the prelymphomatous T cell dyscrasia is in the twenties and thirties.